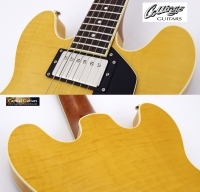 Being an 'LC' (laminated construction) model, this instrument has a multi-ply Maple body, which many players prefer because it resists feedback a bit better and has a more focused tone than Collings' solid wood bodied I-35 models. 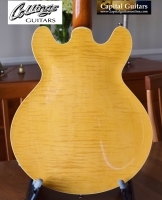 This beauty is finished in Blonde nitrocellulose lacquer and has a total weight of just 7 pounds. This guitar has upgraded cosmetics, including ivoroid neck binding and a multi-ply pickguard. The neck is made of Mahogany. It has a 24-7/8" string scale, a medium/fat C-shape with depth measurements of .845" at the first fret and .980" at the twelfth fret. 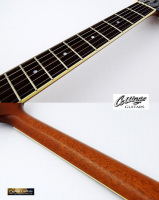 The Indian Rosewood fretboard has a 12" radius, a 1-11/16" nut and medium frets. The electronics on this guitar consist of Lollar low wind Imperial humbuckers, DiMarzio pots, Jupiter caps and a 50's style wiring setups. The bridge is a TonePros AVR and the tuners are Gotohs with ivoroid buttons. 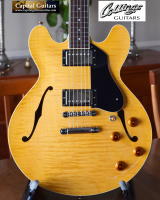 Play this guitar and you recognize that it is based on the ES formula, but has been built with a precision that Gibson has not been able to match. 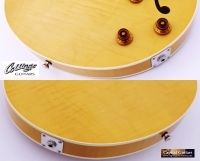 Like virtually all the guitars Collings builds, this I-35LC feels like it was carved from a single piece of wood. The playability is worthy of a guitar costing far more. The tone matches or exceeds that of most any ES model I have ever played. While built in 2015, this looks like a new guitar! It is in near mint condition with no flaws of any significance and the frets are flawless. 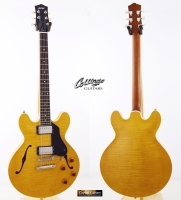 It comes in it's original Collings/Ameritage case, also in mint condition. A new example of this model has a street price of $4,800. Get this near mint 2015 example for $1K less. 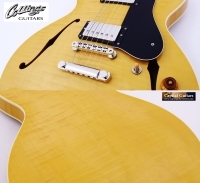 Most who have tried an I-35 agree that this is one of the best semi-hollow electrics available at any price. Try one and see why!